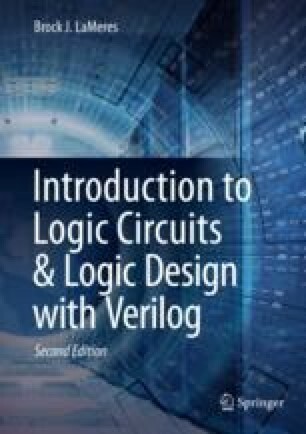 In this chapter we begin looking at sequential logic design. Sequential logic design differs from combinational logic design in that the outputs of the circuit depend not only on the current values of the inputs but also on the past values of the inputs. This is different from the combinational logic design where the output of the circuitry depends only on the current values of the inputs. The ability of a sequential logic circuit to base its outputs on both the current and past inputs allows more sophisticated and intelligent systems to be created. We begin by looking at sequential logic storage devices, which are used to hold the past values of a system. This is followed by an investigation of timing considerations of sequential logic circuits. We then look at some useful circuits that can be created using only sequential logic storage devices. Finally, we look at one of the most important logic circuits in digital systems, the finite-state machine. The goal of this chapter is to provide an understanding of the basic operation of sequential logic circuits.